"Experiences, not things." That's the motto that this couple embraces. 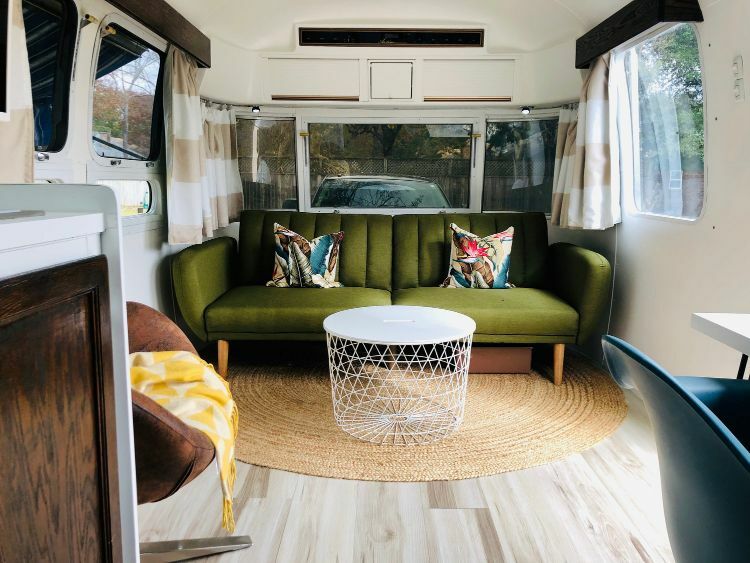 Their current home-away-from-home is a 1985 Sovereign 34' Airstream that they bought in 2018. Known as "a beautiful disaster" when they first purchased her, she has now become an incredible example of what happens when you pursue your dreams and follow your passions. 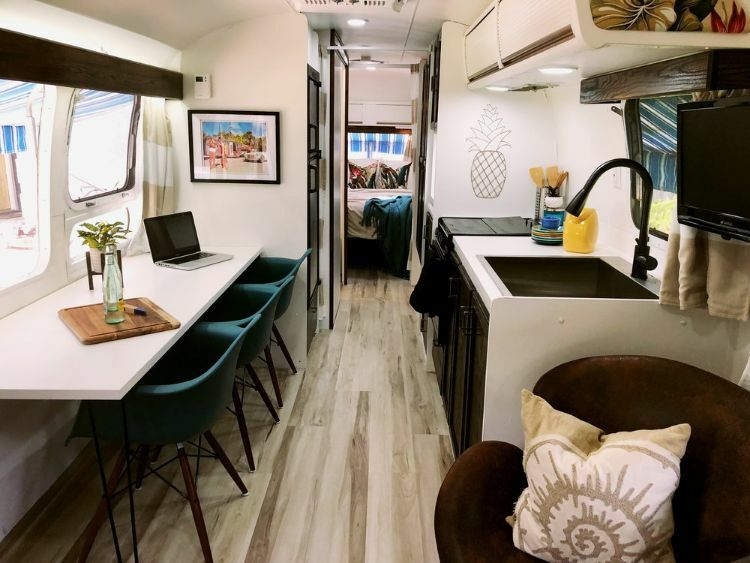 Brittany and Will are the personalities behind TrailerTrashin' – not just an up and coming business that renovates and restores old Airstreams. This is a way of life for the pair, who value memories and experiences over possessions. Brittany is a physician's assistant, and her husband, Will, is a drummer who also happens to have a Ph.D in biomedical science. 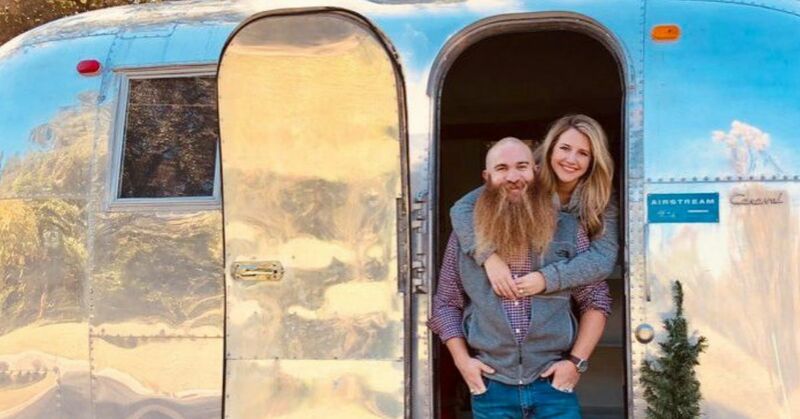 These two Texas A&M Aggies discovered their love for restoring old Airstreams when they were both in graduate school. Brittany has a love of design, and Will has a talent for restoration. Together they make an amazing team. 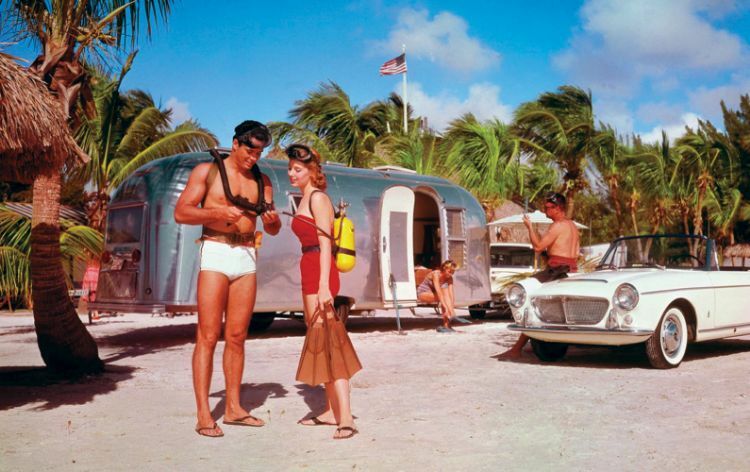 Here's a look at what their Airstream looked like before they began the renovation. Take a peek at how it looks now after all their hard work. The couch is a Novogratz Brittany Sofa Futon. It fits perfectly in the space and can be used as an extra sleeping space or for seating in the living room. The dining area and kitchen efficiently combine function and style. 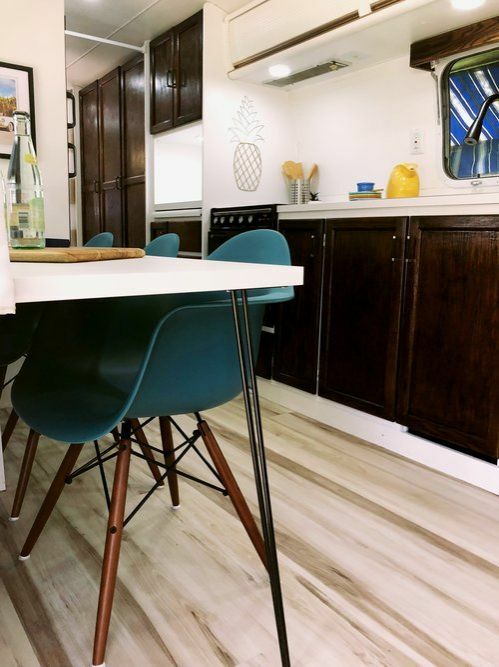 The couple took out an old dinette and replaced it with the table and three blue chairs. Will made the valances out of red oak wood. The color palette in this room reflects the same hues seen in the picture over the dining table. This picture is a special piece of artwork Brittany selected. The artwork is a copy of an actual vintage Airstream advertisement. 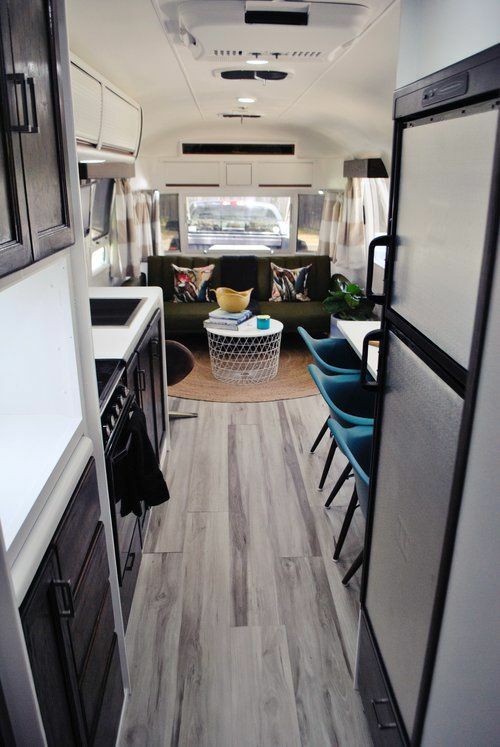 It adds just the right element of adventure and style that Airstream has come to represent. It also happens to blend well with the colors Brittany chose for the decor. Will worked hard to strip, sand and restain the cabinets in a dark walnut. He also added LED lights for extra illumination. 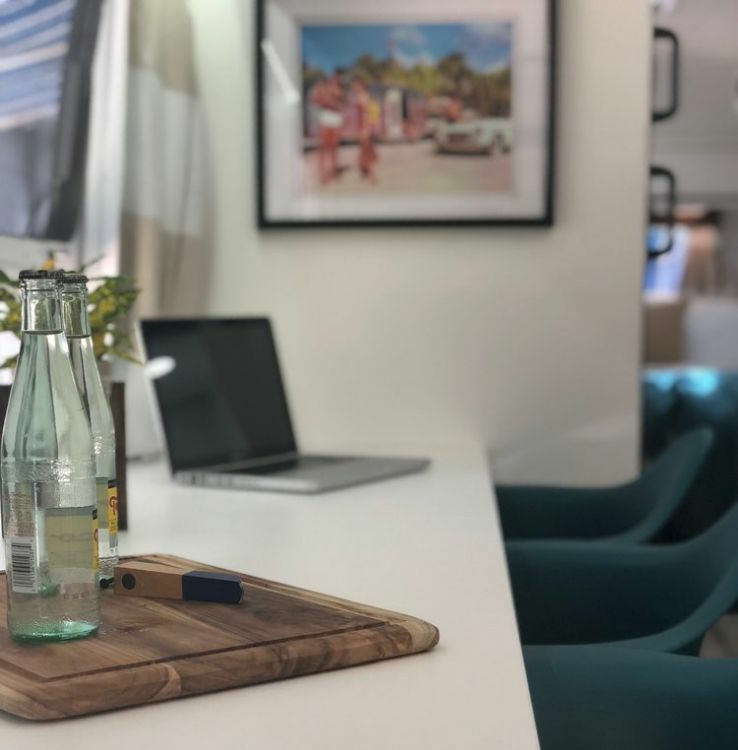 The tabletop is just right for enjoying a beverage while catching up on some work. 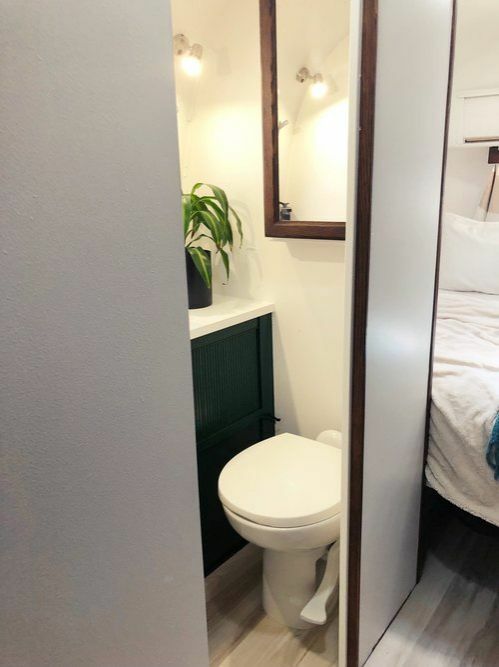 The bathroom also had a makeover. The vanity is stained an attractive hunter green, and a large mirror hangs nearby, reflecting the room's natural light. 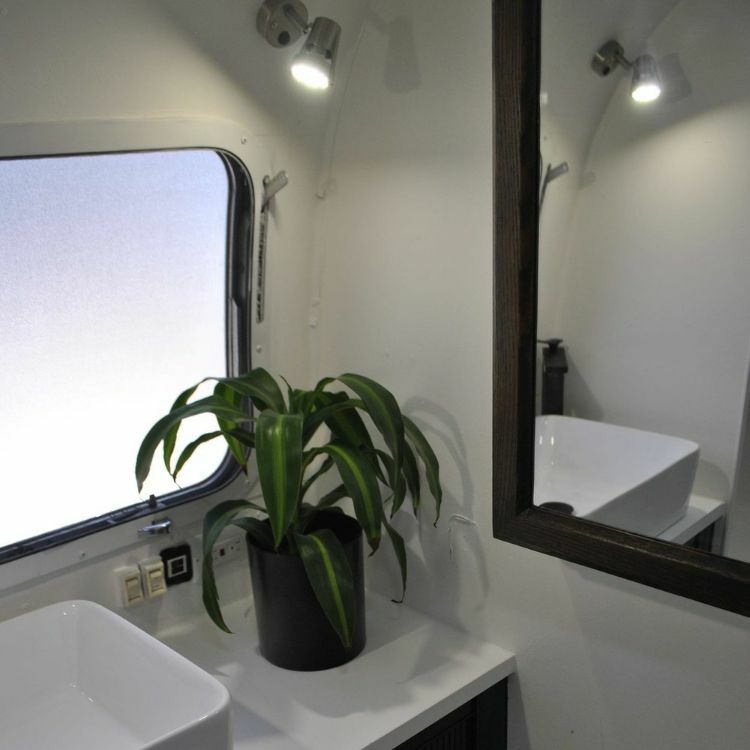 Take note of the brand-new vessel sink as well as a frosted window, which allows for privacy without the need for window coverings. Would you believe that this is a king-sized bed? Getting a good night's sleep is a priority. 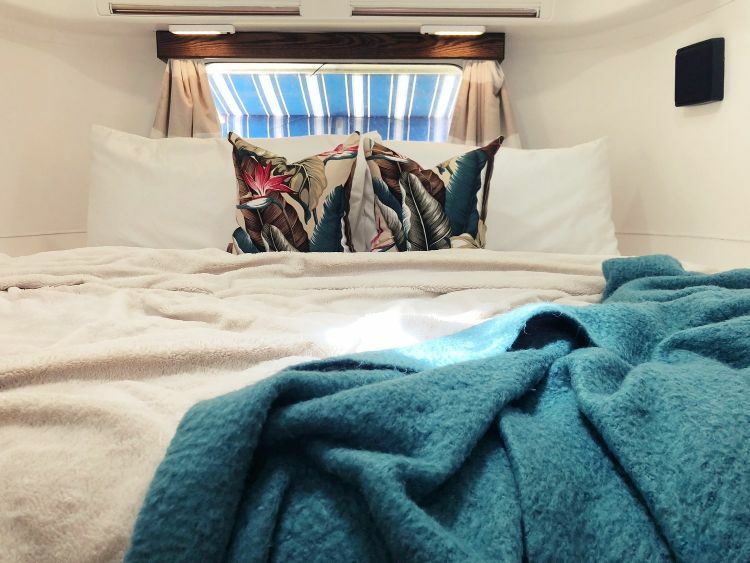 After finishing a mountain hike or a swim in the ocean, there's nothing like coming home to a luxurious bed. The pillows continue the tropical theme from the living room and kitchen, and another red oak valance graces the window. The new refrigerator and freezer in the kitchen add to its efficiency, as well as the abundance of storage there. Back in the living room, it's time to relax on the sofa and start to plan the next adventure. The blue awning outside is ready to be set up for another outdoor picnic. Will it be in the desert or by the sea? 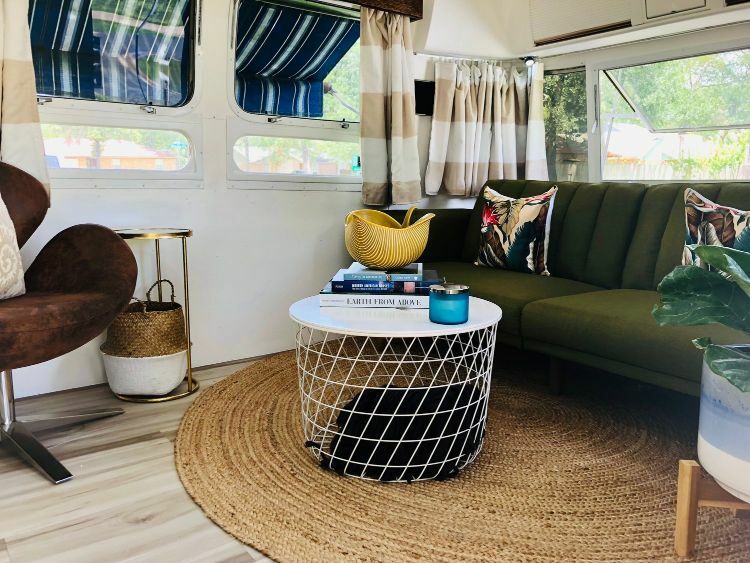 Whatever adventure awaits, it's nice to know that wherever you travel in this beautifully restored Airstream, you'll always be at home.